It says something about the impression this character left on me that he’s only appeared once, in a single issue of East of West, and that alone was enough to merit his spot on this list. East of West #6 is a strange issue, in that after we’ve wrapped up the first arc (or at least the first graphic novel’s worth of content) of the series, we get a largely one-in-done issue that doesn’t feature our main character at all, instead beginning with a look at some of the supporting players, before transitioning into the story of a completely new character. Issue #6 gives us the story of The Ranger. In what appears to be a recurring theme in the world of East of West, his story is one of heartbreak and loss. After his wife is murdered by a blatantly guilty culprit in the most open-and-shut case known to man, a corrupt judge finds the defendant not guilty due to a hefty bribe. And this is one push too far for our Ranger, who snaps, kills the judge and the courtroom attendants, and executes his wife’s killer himself. This kickstarts an uprising, and a new, relentless form of justice that rises through The Republic of Texas, brutal in its extremes but highly effective. 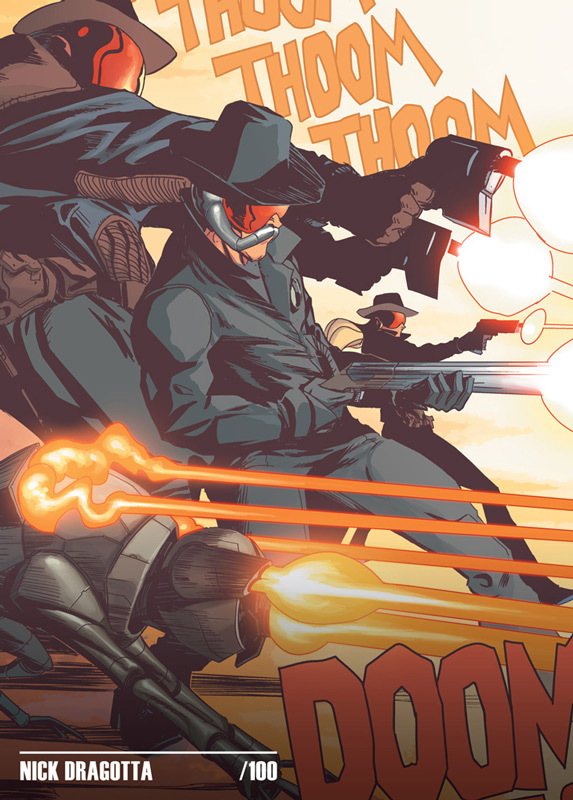 In a relatively small amount of pages, Hickman crafts a character that plays like a cross between Judge Dredd and The Punisher, and Dragotta gifts him with one of the most distinctive designs of anyone in the East of West universe. He even has an adorable little robot dog I never noticed on my first reading! The way The Ranger is realised not only brings him to life, but helps to flesh out the whole mythos of The Republic of Texas as a whole. Right now, The Ranger exists in isolation from most of the characters in the larger narrative. But as issue #6 came to end he’d found a thread that could draw him into the fray, and I can’t wait to see how this exciting new presence collides with more established figures in the story. Now, I could probably go on for another week just gushing about East of West characters, but we need to show some love to other comics creations of 2013. So, this marks the end of East of West week. Starting tomorrow, we move onto different comics, and more amazing new characters! 30 Character Showcase #9: P.I.